Hong Kong surely has few rivals worldwide for being a major city in an outstanding natural setting, surrounded by hills, islands, beaches, waterfalls, wildlife and South China village traditions. Enchanting Hong Kong reveals this multi-faceted destination for a broad spectrum of visitors ranging from those making a short business trip but with some spare time to those who have a bit longer to explore outside the city itself. It provides full information on all the shopping possibilities from the malls to the daytime and night-time markets of Tsim Sha Tsui, Kowloon, Central, Wanchai and Stanley, as well as the many delicious dining possibilities – seafood, especially, is a “must” in Hong Kong. It also takes the visitors a bit further afield to explore the outstanding and extensive network of country trails, the islands, the New Territories and some less well-known beaches. A holiday in Hong Kong can combine a stay in a comfortable hotel with hiking or birding during the day, some shopping, then dinner and a night on the town. It is a many-splendoured place just waiting to be explored. 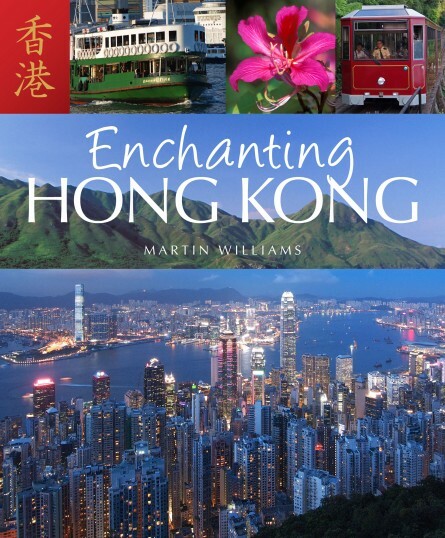 Martin Williams, originally from Yorkshire, UK, and based in Hong Kong since 1987, is a writer and photographer, as well as a nature tour leader and ecological consultant, with a strong interest in wildlife and conservation issues including global warming. He’s written numerous articles for magazines including BBC Wildlife, National Wildlife and Reader’s Digest, and has written and contributed to books including Hong Kong Pathfinder: 24 day-walks in Hong Kong as well as co-producing the nature film Explore Wild Hong Kong.